The Porsche Team Germany player comfortably beat the American qualifier Shelby Rogers. Andrea Petkovic has won her fourth career WTA title at the Bad Gastein tournament. The Porsche Team Germany player comfortably beat the American qualifier Shelby Rogers, who had surprisingly overcome the Italian No. 2 seed Sara Errani in the semi-final, in the final in two straight sets 6-3, 6-3. It is the second time Andrea Petkovic has claimed the clay court tournament as she won her first ever WTA title in the Austrian spa town in 2009. “I was actually quite nervous as I had set my mind on winning. I’m now more relieved than overjoyed,” said the 26-year old German after closing the match out with her first match point in the 73-minute encounter. After winning the Charleston event – also on clay – in USA, it was the French Open semi-finalist’s second tournament win of the season. 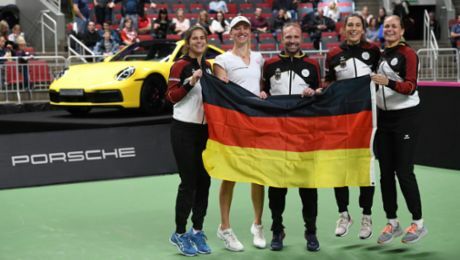 Porsche Team Germany will once again be competing in the Fed Cup World Group containing the top nations. The Porsche Brand Ambassador celebrates her second French Open win. The Porsche Tennis Grand Prix has again attracted the stars to Stuttgart.